Indispensable for a complete understanding of modern Jewish religiosity. 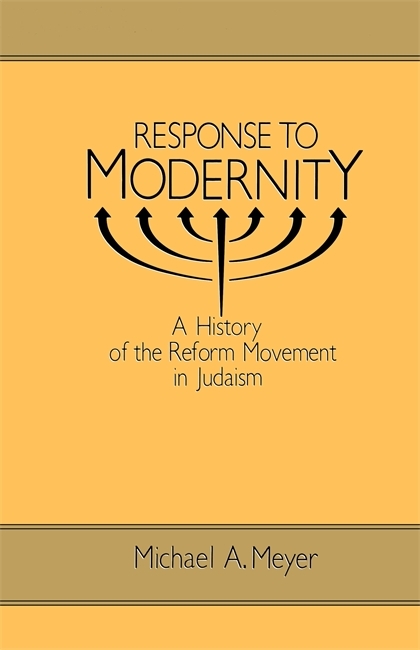 The movement for religious reform in modern Judaism represents one of the most significant phenomena in Jewish history during the last two hundred years. It introduced new theological conceptions and innovations in liturgy and religious practice that affected millions of Jews, first in central and Western Europe and later in the United States. Today Reform Judaism is one of the three major branches of Jewish faith. Bringing to life the ideas, issues, and personalities that have helped to shape modern Jewry, Response to Modernity offers a comprehensive and balanced history of the Reform Movement, tracing its changing configuration and self-understanding from the beginnings of modernization in late 18th century Jewish thought and practice through Reform's American renewal in the 1970s. Michael A. Meyer is Adolph S. Ochs Professor of Jewish History at Hebrew Union College-Jewish Institute of Religion in Cincinnati and the international president of the Leo Baeck Institute. He received his Ph.D. from Hebrew Union College. A sweeping narrative of the development of religious reform within Judaism and its institutionalization in the course of the last two centuries . . . a thorough mastery of the complex intellectual and social currents that have shaped the contours of Judaism . . . will become a standard work in the field.